In days of persecution priests would hide in small 'priest holes' hidden behind walls, so as to escape being caught by the authorities. The conditions were cramped and often priests would remain there for days or even weeks. Today Fr Andrew got the opportunity to try something similiar (albeit in a much less threatening environment), with a visit to the very cramped interior of the Cathedral organ. The ongoing restoration programme has seen a number of significant moments over the last few weeks. The wind has been reconnected and last week the organ made its first sound in well over a year. There is still much to do, but the progress is encouraging. Today another milestone: the first pipes were taken from the Swell, to be sent to Liverpool for restoration. The holes in the soundboard mark the spots from where the first few pipes have now been taken. Each is labelled and wrapped ready for the journey to the workshop. The picture above also shows just how much cleaning is required, and how cramped the conditions are - the wooden plank in the centre is the only place for the organ builder to stand as he works. Looking out through some of the larger pipes in the organ case, a variety of tools can be seen. Also visible is a test console, which is due to be linked up to the Great organ in order to check that everything is in working order. Over the next fortnight or so all of the pipes on the Great and Pedal departments are due to be reinstalled and the pipes and soundboards on the other side will be taken for restoration. It will still be some time before the organ is up and running, but it will certainly be worth the wait. The work is being carried out by Willis and Sons (Liverpool) - click here for more. 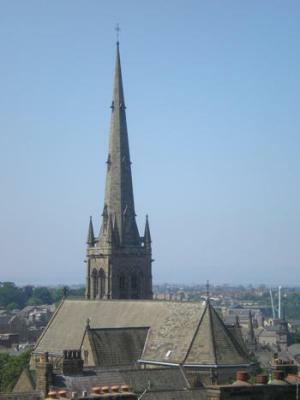 is the mother church of the Catholic Diocese of Lancaster, which stretches from Preston to the Scottish border. The Cathedral acts as a focal point for the diocese, as well as being home to a vibrant parish community. It also hosts a number of concerts and cultural events throughout the year.